The concerned other is desperate for change in the problematic drug or alcohol user, but often ends up feeling helpless and frustrated - let down by his or her own inability of help and by a lack of professional support. Professional helpers, on the other hand, may find that their training, geared to the individualistic theories that require the user to make the change, find they are unable to employ effectively the concerned other and his or her willingness to help. This major new theoretical work explores the extensive research, documented in over 150 references, that demonstrates why and how families can effect change. Author Phil Harris sees the concerned other as the person most able to effect change in the user's life, whilst also taking good are of themselves. Here he presents the thoroughly researched and carefully argued theoretical underpinning of his work with substance users and their families. 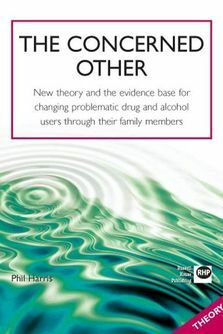 This book is essential reading for academics, researchers, students, policy-makers, and for those people working with alcohol or substance misuse who want to bring themselves up-to=date on current ways of thinking, but who do not need the full worksheet-based programme that is available in the complete manual for anyone undertaking this work. 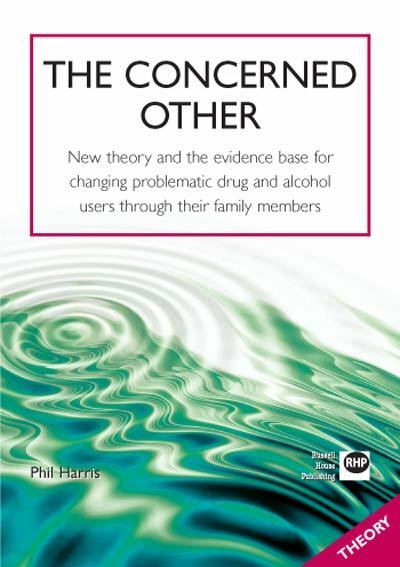 The whole text of this book as also been published as Part 1 of that complete treatment manual - Phil Harris: The concerned other = how to change problematic drug users through their family members: a complete manual (ISBNL 978-1-905541-48-5). It has been published separately here, in response to demand from both students and practitioners who only want to study the work with concerned others, rather than undertake it. Academics, researchers, students, policy makers and practitioners in: alcohol and substance misuse, social work, psychology, counselling, youth work, housing, education and family support. Phil Harris is an independent writer who has worked in direct access drug services for over sixteen years. He has designed and delivered internationally recognised treatment programmes and accredited training courses throughout the UK and Europe. having work as a drug treatment advisor to DST's, Criminal Justice Services and Youth Services, he has also managed several organisation and implemented innovative, practical and effective approaches to addressing people's problems with misuse of drugs and alcohol. He continues to practice in the South West of England.